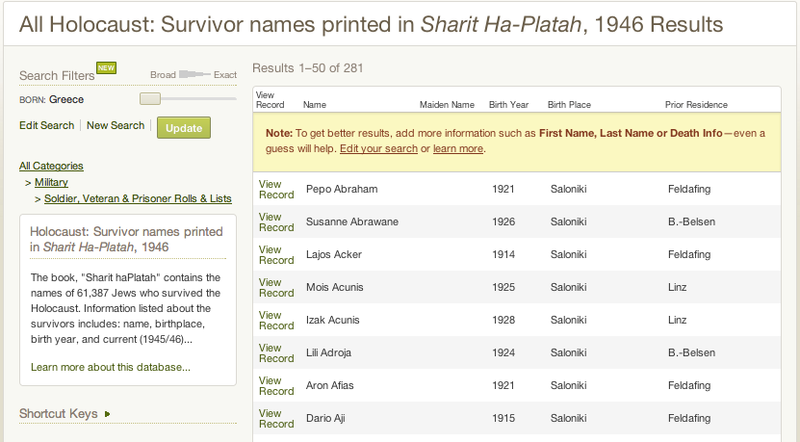 Ancestry.com has a database online that is titled - HOLOCAUST: SURVIVOR NAMES PRINTED IN SHARIT-HA-PLATAH, 1946 which includes 281 people who listed Greece as their place of birth. Sharit Ha-Platah, translated into English as "Holocaust Survivors" or literally as "Counted Remnant", was published in 1946 by the "Central Committee of Jews in Bavaria", in Munich, Germany. The frontispiece says, "an extensive list of survivors of Nazi tyranny published so that the lost may be found and the dead brought back to life." The book contains the names of 61,387 Jews who survived the Holocaust. This collection largely reflects the efforts of Chaplain (Rabbi) Abraham Klausner, who visited many of the camps in southern Germany where survivors had gathered in late 1945 and 1946. During these visits, he collected lists of the persons residing there which were originally published by region. Subsequently, these lists with additional names not limited to Germany were combined into a single publication. Also included are ID, page and line number of each record. Utilizing this basic information, it is often possible to establish where these persons subsequently went.